These Christmas Stocking bags make up sew easy and are sew cute! They can double as a purse to carry or be used as an actual stocking. This set of Christmas Stocking Bags come in 2 sizes. There are two files to each stocking, a “back” and “finish”. The entire stocking bag is not only quilted but completely finished in the hoop in just two hoopings with no raw seams showing inside. 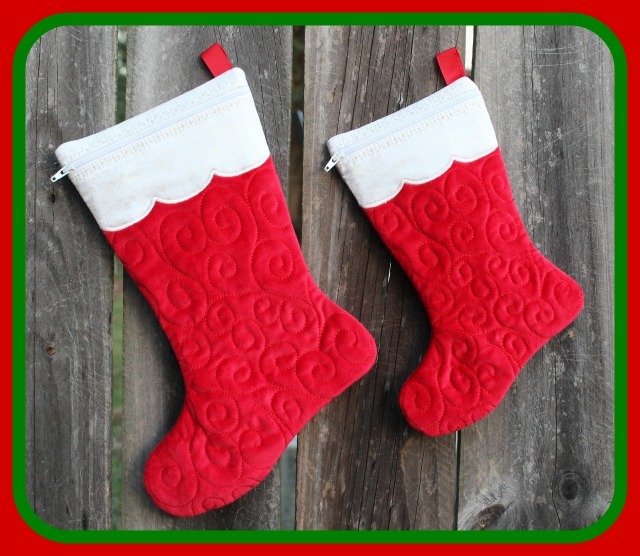 This page is for the LARGE set of stocking bags which includes the 2 largest sizes. If you want the small set including the 3 smallest sizes, click here OR if you want ALL sizes which is the best buy $$$, click here. Two hoop sizes included: XLG-8" X 11" AND JUMBO-9 1/2" X 14"